Police are looking for the offender who cut a man’s face with a knife on a CTA bus in Chicago’s Austin neighborhood. Chicago police said that at 4:15 p.m. Feb. 6, a 48-year-old man was sitting on a southbound Cicero Avenue bus on the 300 block of North Cicero Avenue. The man was sitting toward the rear of the Chicago Transit Authority vehicle when the offender, who was sitting next to him, fell asleep on him. The man pushed the offender off of him and the offender then brandished a knife and cut the victim’s face. The victim, while attempting to defend himself, grabbed the knife and was also cut on the hand. The offender then fled the bus and boarded a following bus that was also heading southbound on Cicero. The offender was described as a black man, 20-30 years old, 6 feet, 160 pounds, and wearing a blue and red hat and jacket, and black pants. Pay special attention to suspicious people loitering in the area and report them to police. If confronted by an offender, remain calm. Never pursue a fleeing assailant. Provide the information to police. Call 911 immediately and provide a detailed description of the offender. 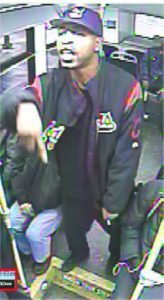 Anyone with information about the CTA attack or the offender should contact the Chicago Police Department’s Bureau of Detectives for Area North at 312-744-8261.